"This year, Puma decided again to create a new calendar that is "timeless". With a small Edition of only 1,000 pieces worldwide, we created a unique collection of traditional craftsmanship. Great photos and a little history of Puma at the back side, turn this calendar into a unique collector's item that can be reused every year. The individual days per month are listed, but not with the weekdays. This calendar is a "MUST" for every hunter, knife lover and collector. "PUMA is one of the great brands which have made Solingen famous as the "Klingenstadt" (the city of blades). The PUMA Werk Lauterjung und Sohn was founded in 1769. Today, just like 247 years ago, we manufacture knives and cutlery in top handmade quality under the brand name PUMA. We combine traditional craftsmanship with modern manufacturing techniques. The range of products made by the brand PUMA from Solingen stands especially for classical knives in the best handmade production, with design-oriented forms and types as well as for technical perfected cutlery. 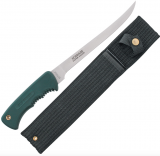 The assortment extends from fixed and folding classical hunting knives to knives for almost all outdoor activities and to high-quality collecting knives. 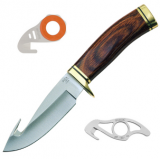 You can find special classical hunting knives for example PUMA Jagdnicker, PUMA waidblatt, PUMA jagdtaschenmesser by chief forester Walter Frevert or the famous PUMA white hunter knife, and also many knives, which are familiar to you: there are the Trapper Knife PUMA Bowie e.g. or PUMA falknersheil, a particularly developped model for falconry. We also offer the new water sports series, PUMA frogman, a diving knife, whose original model was already successfully produced in the 1970s." A massive knife for the great Aussie Outdoorsman. A Croc Dundee Classic Knife but this is no wall hanger. It is a genuine knife to be used in the great Aussie Bush and is razor sharp. Weight a hefty 3.05 lb. Comes with a genuine leather sheath and sharpening spike. As seen in the Sun Herald Croc Dundee feature.